CINCINNATI (August 10, 2012) - World No. 25 Tommy Haas and former World No. 1 Lleyton Hewitt join the men’s draw at the Western & Southern Open as the field gets finalized ahead of Friday’s draw party. On the women’s side, defending Cincinnati champion and World No. 2 Maria Sharapova, a recent silver medalist at the London Olympics for Russia, has pulled out citing a stomach illness. The virus forced the Roland Garros champion to pull out of the WTA event in Montreal this week. On the men’s side, World No. 6 Jo-Wilfried Tsonga of France withdrew from the Western & Southern Open with a knee injury. Earlier this summer, Tsonga advanced to the quarterfinals at the Olympics and the semifinals at Wimbledon. Due to other ATP player withdrawals (listed below), Germany’s Tommy Haas gains direct entrance into the men’s main draw. At 34-years old, Haas is currently ranked World No. 25. He claimed a Tour title at Halle this year and finished as runner-up at both Washington and Hamburg. Joining Haas directly into the main draw is Ryan Harrison, who previously received one of four wild cards into the event. Former World No. 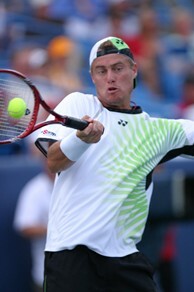 1 and two-time Cincinnati finalist Lleyton Hewitt takes Harrison’s wild card. Additionally, World No. 20 Andy Roddick becomes the tournament’s No. 16 seed. Roddick, the 2003 US Open champion, won at Cincinnati in 2003 and 2006.